When I think of how amazing childhood can be, I also reflect on the many children whose experience is less than what they deserve. Children are the product of not only their genetic traits, but also their physical and spiritual environment and experiences. When a child has a spiritual problem, the effects of spiritual negativity could ruin an otherwise wonderful childhood. A few years ago Leo and I had the opportunity to help a young boy that lived in our neighborhood. When we moved into our new home on a cul-de-sac, a couple of the neighbors came by to greet us and then, in turn, to warn us about ‘Danny’, the five-year-old boy next door. According to the neighbors, Danny was notorious for hitting golf balls from his driveway in all directions. They told us that he had struck their parked cars and even broken a picture window in one of the houses. An older woman claimed that she was afraid to work in her garden whenever the boy was outside. She exclaimed that: “He just ruins our neighborhood.” It surprised me that everyone was complaining about such an innocuous little boy. Later that day, Danny came around to meet us, accompanied by his mother and two brothers. When his mother, a nurse, learned that we did spiritual healing, she immediately started to tell us how difficult it was to deal with Danny. She said that she had taken him out of kindergarten, because there were already signs that he would have been prescribed Ritalin to control his ADD. She wasn’t sure if he would be able to start the 1st grade in the same school system without succumbing to the drug requirement. On that first meeting she asked if there was anything we could do to help her son. Leo said that he would talk to him the next day, after we had finished moving our boxes inside. The following day, Danny came by with his mother. Leo asked Danny if he liked the spirit that he had. Danny said that he didn’t like it, because it was always making him to do things that got him into trouble. Leo asked him if he wanted to have a new spirit, one that would help him. Danny broke out a huge smile and said that he would like that. He looked at his mother for approval and she nodded to him that it was okay. Leo removed a negatively-oriented spirit from Danny and brought him a positively-oriented one that was more suitable for his body. The following weekend, Danny was out on the driveway with his father and brother, putting the wheels from his brother’s old skateboard onto a new frame. From then on, almost everyday we could see Danny out on his driveway, diligently concentrating on his technique and setting up jumps, such as his favorite one over his bicycle. His tireless efforts paid off, and soon his technique coupled agility with precision as he glided gracefully over his bike every time. Whenever we saw Danny playing outside, he kept asking us to come and watch him practice at the skate park down the road. 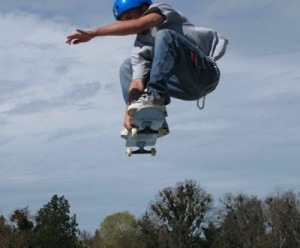 A few weeks later, when Leo and I finally stopped in to see how he was doing, the skate park attendant told us that Danny had organized the most difficult jump to give the younger kids a chance to use it. Whenever Danny was there, the children stood patiently in line, awaiting their turn. He was already showing leadership skills and had gained the respect and friendship of all the children at the park! Not only had Danny become adept on his skateboard, but he began to believe in himself in other ways. He was doing so well in school that he was selected to move ahead halfway through the first grade to make early entry into the second grade. He had also begun to eat better and used to chide his brother for eating junk food. And he stopped hitting golf balls at available targets. Whenever I think of Danny, I see him working intently on his skateboard moves and grinning as he looks back triumphantly at each successful accomplishment. The reason that I wanted to tell this particular story is because it exemplifies the plight of so many highly creative intelligent children whose problems are essentially spiritual. When a bright intuitive child like Danny is beleaguered by the impact of a spirit that is ill-suited for his body, the resulting chemical imbalance can adversely affect his behavior. However, when a suitable spirit can be properly matched with a child’s body, they work in harmony together. Fortunately, Danny’s mother believed enough in her child and his spiritual well-being to allow her son to enjoy a positively-oriented spirit and reclaim his childhood. Leo says: “Show me a mischievous child and I see a creative genius.” Children always keep it simple and will readily respond to a positive spiritual experience. What a wonderful story! We are on the same page. I have a post from Jan. 2012 called Howard’s Story, baby steps to positive change, you might want to check out. I loved this post!